It’s hard to pinpoint exactly when we entered what seems to be some kind of weird golden age of oral histories on different beloved comedy properties, but there’s no denying that we have. Perhaps it’s a byproduct of the age of the comedy podcast, which both fed and generated unprecedented interest in how the meat was made in terms of movies, TV shows and careers in general. Anyway, it seems like every day is a big anniversary for comedy cultists and, thanks largely to the efforts of Vulture, Vanity Fair, Variety, and even some “non-V” outlets, the comedy oral history has become a booming medium in and of itself. Here are some of our favorites. The sheer number of famous people generated by the improv and sketch scenes in different cities make them ripe for the picking in these kinds of pieces, since everyone has a kind of fascination with seeing a surprise celebrity pop up for an anecdote about how they used to love performing in crowded bars and smelly basements. Both abound in the Village Voice’s oral history of ASSSSCAT, which covers, necessarily, a huge part of the rise of UCB in New York. A similar take on a different institution is Vanity Fair’s history of the Groundings, which depicts the same lo-fi comedy culture that gave rise to a slightly earlier generation of comedians. Obviously the huge printed elephant in the room is James Andrew Miller and Tom Shales’s Live From New York, a reliably definitive, thoroughly multi-generational saga of SNL which particularly sings in early chapters that detail the fragile process that laid the foundational work for one of TV’s longest-running shows. Bonus points for reading the revised and expanded edition, which provides fascinating context on the modern history of the show, acting as a rebuttal, or at least a complication of, the Golden Age mentality that sometimes plagues SNL fans. Equally fascinating for the show in question’s lack of cultural staying power is Vulture’s history of MADtv. And your high-minded comedy nerds out there will flock to “Hall Pass,” a relatively obscure profile of The Kids in the Hall that illuminates not only that particular show’s huge dissemination of talent and influence throughout the subsequent ‘90s alt-sketch comedy boom, but also the greater influence of Canadian comedy on American comedy post-SCTV. Unfortunately, there aren’t a ton of significant oral histories on stand-up out there. But the two that stand out provide interesting counter-points. On one end, you have Yael Kohen’s We Killed, a book dedicated to the rise of women in comedy. On the other, you have Vanity Fair’s history of the Comedy Cellar, a legendary venue with a complicated legacy as a boy’s club that becomes even more complicated after Gawker and the New York Times’ reporting on Louis C.K. Oral histories on comedy films abound. The AV Club got in the game with “Surely You Can’t Be Serious,” on the making of Airplane! (though their in-depth interviews with showrunners on specific seasons of TV serve a similar function). Still, the future of the medium may be Vulture’s series of hyper-specific entertainment oral histories, which allow reporters to focus on the nitty-gritty of film production in a way that should satisfy your bloodlust for exhaustive details about the things you love. 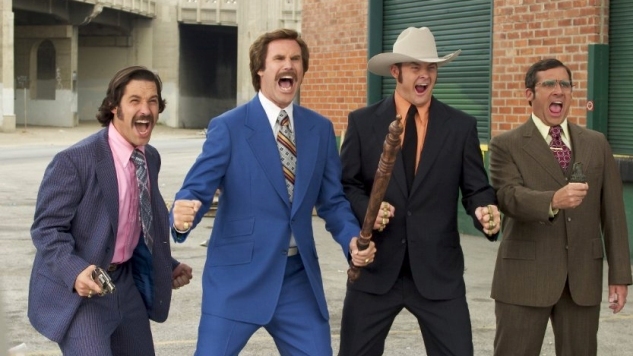 Case in point: their extremely entertaining history of Anchorman’s back alley battle scene, which, most importantly, gives you a little insight into the improvisational Adam McKay process that dominates comedy filmmaking (for better or worse) these days. My favorite of these, however, is the history of Wet Hot American Summer that Variety ran in advance of First Day of Camp. While a lot of the film’s production troubles (almost every day of shooting was plagued by a rainstorm) are covered in the documentary Hurricane of Fun, being able to read the filmmakers’ takes on those same events in hindsight gives us an idea of how miraculous the film’s cult status is, in addition to how complicated the path towards actually getting the movie made in the first place was. A lot of these pieces cover art that is beloved despite being initially unsuccessful, but none more so than Vanity Fair’s now iconic look at the making of Freaks and Geeks, which sits somewhere between bittersweet and genuinely depressing, despite the subsequent super-fame of practically everyone involved. The difficulty in summing up an entire TV show in one piece, though, often becomes a hidden advantage. Vanity Fair’s “Simpsons Family Values” is still a classic of the genre, but it won’t be as much interest to Simpsons fans as Vulture’s (again) hyper-specific history of the show’s Planet of the Apes musical, which not only details the working relationship between composer Alf Clausen and the writer’s room, but also Clausen’s under-appreciated influence on the show’s comedic tone (especially important to remember in the wake of his unceremonious sacking). Pieces like these showcase what the form can do really well: allow us access into an aspect of a work of art that we previously took for granted due to a lack of context.